The Sermon - Week One: "Blessed"
There are lots of legends that surround Chuck Yaeger, the jet pilot who broke the sound barrier in 1947, but one in particular speaks to his singular ability to defy convention, push down fear and accomplish what had been thought impossible. Almost every pilot who had attempted to break the sound barrier before him had perished in the process. Legend has it Yaeger discovered the controls of the jet would act differently as the plane approached the speed required to break the sound barrier, so much so that they were very nearly reversed. Only by treating them as if they were upside down, so to speak, would the plane operate under the extreme conditions imposed upon it by exceeding Mach 1. It's a legend, to be sure, but an interesting one. And it begs an interesting question... How many of us would be willing to trust that the controls of the jet we were piloting at supersonic speed would actually work the opposite of how we've been told they were supposed to work? And here's an even more interesting question... What if I told you that life works the same way--that here's a moment when we need to live the opposite way our culture has told us we need to live in order to truly be happy? This week we are starting a brand new sermon series entitled "The Sermon"--a study of the Sermon on the Mount--a sermon that is outlined best in Matthew's Gospel stretching over three chapters, and contains Jesus' essential teachings on the kingdom of God, and how to live as citizens of that kingdom. Matthew chapter 5 begins with the words, "When Jesus saw the multitudes of people gathering, he went up to a mountainside and sat down. His disciples came to him, and he began to teach them..."
This was a highly symbolic move by Jesus. He begins his ministry on a mountainside (more of a hill really), re-interpreting the Torah--the teachings that were given by Moses... who also delivered teaching from a mountain. Moses shared God's covenant with the people of Israel at Sinai. Jesus shared God's new covenant with all people, everywhere at Galilee. What becomes clear right away when you read the Sermon on the Mount is that Jesus wants his followers to live differently. He is calling us away from the grubby mediocrity that is not part of God's kingdom, and calling us into lives defined by "kalos" living. "Kalos" is a word that means "beauty." In other words, Jesus wants us to live--beautiful lives. "Happiness" is a word that looms large in the first twelve verses of the Sermon. But our understanding of happiness is fairly shallow and largely defined by the way that our culture defines it. One of my favorite movies of all time is "The Princess Bride," so some of you will understand me when I say this... When it comes to happiness--people keep saying that word, and trying to define it--but "I don' think that word means what you think it means..."
The definition of insanity is doing the same thing over and over again and expecting a different result. And people in our culture seem to think that true happiness can be found by embracing the same destructive patterns--over and over again. Only these destructive patterns don't lead to happiness they lead to destruction. The happiness we seek comes when we begin to realize that the "controls" don't work the way we've been told they work. True happiness is a direct result of an upside-down, Jesus-centered life. The Greek word that is used here for "blessed" is makarios or "happy." Jesus is literally saying, "How happy are those who are..." If you want to live a beautiful life, then you need to understand the path to true happiness--which is why we use the word "Beatitudes" to describe this passage of Scripture. This is beautiful living. If you take a look at the first four of the Beatitudes you can see clearly that they speak to those who are in need. These are people with longings deep down inside of their very souls. The final four Beatitudes speak to how the kingdom of God belongs to those who are transformed. First four--this is how you were: in need, longing, desperate... Second four--this is what you become once you begin to live beautifully. They don't make sense on the surface, do they? Think about it. "How happy are the depressed... those in grief... those who don't matter to the world... those who hunger for more than this world has to offer..."
These are startling words. But they are calculated and deep and absolutely what Jesus wanted us to understand and to know. Happiness, he tells his followers, doesn't come from political, economic or personal power "to make things happen." This is how the world works, though, which Jesus seems all too aware of as he speaks. Happiness, Jesus teaches, comes when you lay aside--political, economic and personal power... When you start using the controls, "upside down." What if we wrote a Beatitudes for our culture? What would it look like? Blessed are those who are rich--with money as well as confidence. Blessed are those who are untouched by loss. Blessed are those who are "realistic" about righteousness, compromising at ever turn. Blessed are those who demand and exact eye for an eye when they are wronged. Blessed are those bold enough to make war and crafty enough to justify it. Blessed are those who do good things in order to hear applause. Blessed are those who use the name of Jesus to become adored and widely praised by everyone. Isn't that beautiful? Of course not. It's ugly. We know it's ugly. And we also know that this form of the Beatitudes is the pattern that our culture keeps teaching us to follow. When you see it sort of laid out like this--you can see how destructive it is, can't you? But Jesus offers an upside down way of living that may not make sense to our culture, but definitely makes sense in the kingdom of God. Blessed are the poor in spirit--the connotation of this saying is simply this: How happy are those who are are at the end of their rope...and are helpless...with no where to go but God. Blessed are those who mourn--what Jesus is saying here is this: How happy are those who feel sorrow for the things that they've lost... sorrow for the sins that they've committed... sorrow for the sins of others that have made this world what it is... and who need to hear God's message of grace. Blessed are the meek---How happy are those who set aside their need for control, who are filled with self-honesty about their weakness, their frailty, their brokenness, and who need God's healing to make them whole. Blessed are those who hunger and thirst for righteousness--How happy are those who set aside their need to be "right," and who realize it's not about religion, it's not about keeping the rules---it's about having a real relationship with God. Merciful--because when you live beautifully you will become the kind of person who can selflessly care for others more than yourself. Pure in heart--you be able to set aside all of the anxious obstacles to hope in your life. Peacemakers--this word has the connotation of someone who is writing poetry. When you live beautifully, Jesus is saying, you will have a poetic gift for imitating God on the run, even in places where God doesn't seem to be at work. Persecuted--when you live beautifully, you often find that the old way you used to live, the person you used to be was much more popular in this world than the new "you." This anticipates the cross--the fact that you may have things in your life that must die so that you can truly live. 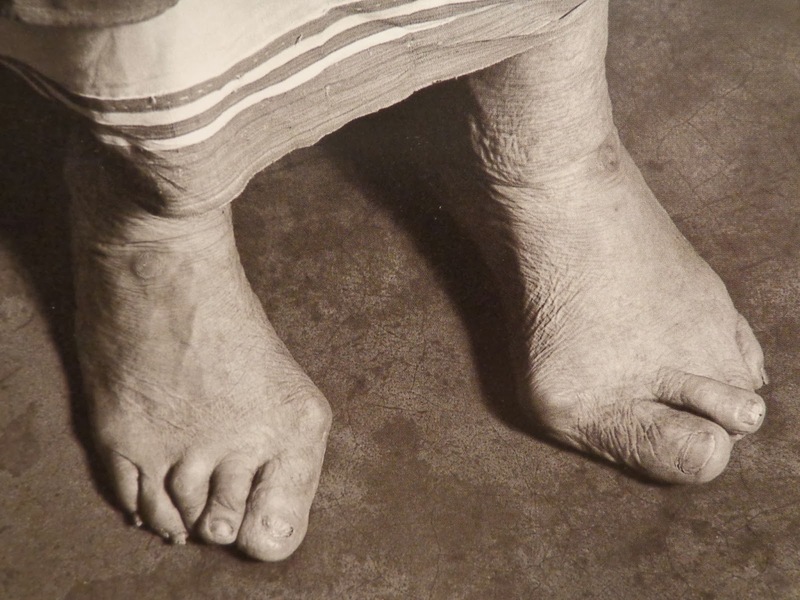 This is a photo of the feet of Mother Theresa, who devoted her life to serve the poor in India. Mother Theresa's feet were so deformed that she could barely walk on them--a product of years of fitting them into the wrong-sized shoes. You see, every time there as a donation of shoes to her mission--Mother Theresa would ensure that everyone else got the right size shoe, and she would then do her best to find a pair out of those left over. Her feet are an embodiment of the way she lived her life--giving up what everyone told her was the way to happiness, and choosing the "upside-down" Jesus-centered way. But beautiful in the eyes of God. In God's kingdom beautiful living looks so much different than it does in the kingdom of our culture... don't you think? Because true happiness is a direct result of an upside down, Jesus-centered life.